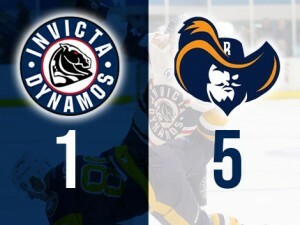 Brandon Miles dropped the gloves with Mason Webster and Oskars Ancitis found the target but it was not enough to prevent a battling Invicta Dynamos slipping to a 5-1 home defeat at the hands of the London Raiders on Saturday. Kevin Parrish’s side went into the game without the services of Callum Best and Ryan Giles, but once again called upon Luke Thirkettle to give them 16 skaters and netminder Conor Morris. The visiting side had the slight numerical advantage and at times throughout the evening, the fresher legs were to pay dividends. In the opening exchanges and throughout the first twenty minutes, it was hard to see who were propping up the league with the Dynamos forcing the issue, but despite shots at either end, the scoreline was to remain goalless after twenty minutes. There were less than two minutes on the clock in the second period when the visitors opened the scoring – Matt Turner firing beyond Morris from close range after good work from JJ Pitchley and former Mo, Mason Webster. Just 40 seconds later and it was 2-0 to Raiders when Tommy Huggett evaded the Dynamos defence and shot though Morris’ legs from close left. As tensions began to rise, it was inevitable there was going to be a scrap and no one was surprised that it was Brandon Miles and Mason Webster that came to blows. Both players landed punches, but neither were prepared to drop to the ice. Just a minute later and former Mo, Juraj Huska made it 3-0, deflating the home side support. With the visitors having been called for too many men on the ice, the Dynamos took full advantage as Oskars Ancitis slammed home a slapshot from the back of the circle to cut the deficit to two. At 3-1 down going into the final period, the game was still very much in the balance and the Dynamos really forced the issue but lost Harrison Lillis to a broken collarbone after he collided with the boards. Shots were fired in at both ends and with less than three minutes left on the clock, the Dynamos tried to take full advantage of a powerplay, going 6 on 4 after pulling Morris, but it backfired as Ollie Baldock swept home into the empty net from the halfway line. It was a gamble that needed to be taken, but didn’t pay off and the Dynamos’ misery was compounded with just ten seconds left in the game as Brandon Webster fired home against his former side. In the end, the result will go in the record books as a 5-1 loss for the Dynamos, but they will take great heart from a spirited performance.